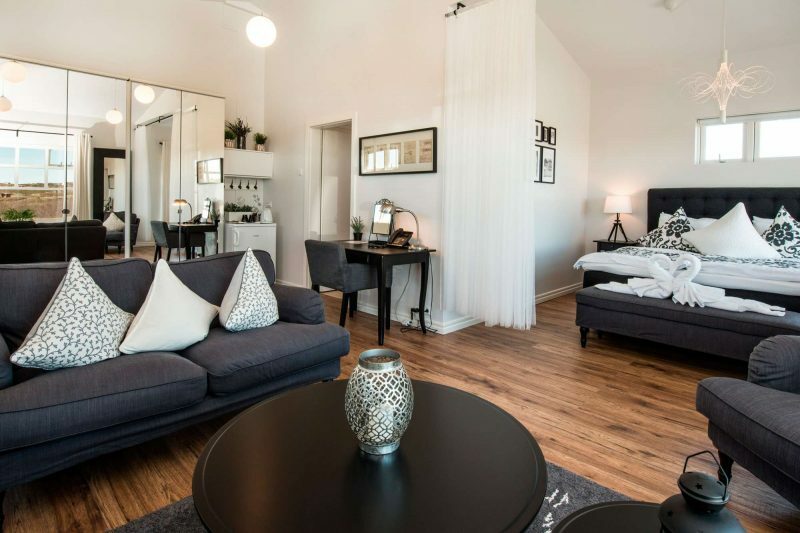 If you are looking for the perfect place to stay in luxury in the heart of the Golden Circle, Grimsborgir Luxury Apartments are offering Discover the World clients some great savings. Surrounded by picturesque landscapes in south west Iceland, Hotel Grímsborgir is located next to the beautiful Sog, Iceland’s largest freshwater river. Just a 45-minute drive from Reykjavik and a 90-minute drive from Keflavik international airport, the hotel offers a range of accommodation – from stylish superior rooms to luxury apartments, all with a terrace and access to outdoor hot tubs. Choose our Aurora Nights self-drive package or contact our Iceland Specialists to tailor make your holiday and achieve great savings at this luxury property. Just a 45-minute drive from Reykjavik and a 90-minute drive from Keflavik international airport, the hotel is conveniently located for exploring the Golden Circle.